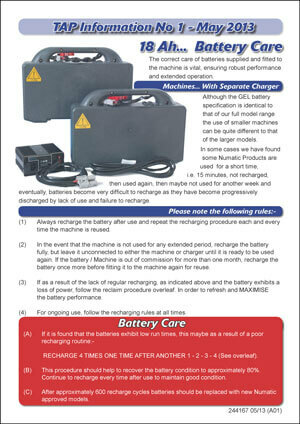 The correct care of batteries supplied and fitted to the machine is vital, ensuring robust performance and extended operation. Although the GEL battery specification is identical to that of our full model range the use of smaller machines can be quite different to that of the larger models. In some cases we have found some Numatic Products are used for a short time, i.e. 15 minutes, not recharged, then used again, then maybe not used for another week and eventually, batteries become very difficult to recharge as they have become progressively discharged by lack of use and failure to recharge.